Mike McClelland, who owns and operates The Best of New Zealand Fly Fishing travel business, was born in Los Angeles and grew up in Southern California. His early fishing experience was limited to fishing with salmon eggs to small stocked trout in local creeks until he attended the University of Colorado in Boulder in the early 60’s and was exposed to fly fishing in the Rocky Mountain streams. After graduation, he pursued his new interest in fly fishing with trips to Alaska, Montana, Ireland, and New Zealand. Mike started the travel agency in 1981. 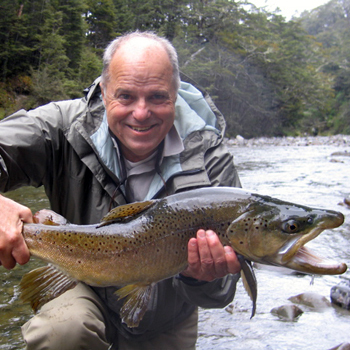 Mike McClelland has been fly fishing and hosting trips to New Zealand for over 16 years. Listen to Mike share the challenges and successes of landing nine pound browns in 20 foot wide streams. In 1983, while traveling with his wife and two daughters, Mike discovered the many undisturbed trout streams in the Himalayan Kingdom of Bhutan. After hosting a party for the country’s first Olympic team (which competed in Los Angeles in 1984) and an exploratory fishing trip in 1985, he then organized and lead the first group to fly fish this mountainous Shangri-La in 1986. Mike continues to visit and fish Bhutan and recently made his 21st visit to the country. Mike first fished New Zealand in 1974 and has made over 43 trips since then to explore, research, and enjoy this beautiful and friendly country. After organizing groups to fly fish the Himalayan Kingdom of Bhutan in the mid-80's, Mike decided to concentrate solely on New Zealand in 1989. The Best of New Zealand Fly Fishing is unique in the travel industry because New Zealand is its only destination!! It has specialized exclusively in New Zealand travel for over sixteen years and assists more anglers with trips to New Zealand than anyone else. The company sells exclusive fishing programs; however, most of its itineraries include sightseeing and other nature-based activities of interest-- such as golf, winery tours, bird watching, trekking, sea kayaking, etc. In the past year Mike made three trips to New Zealand and sampled both the early season and the late season fishing --see his articles on each trip: Early Season Fishing Is As Good As They Say! and Late Season Fishing Is As Good As They Say!. Mike and each of his Best of New Zealand team take multiple trips to New Zealand. Each of Mike’s employees travels to New Zealand at least once a year to visit the properties used, spend time with the managers and fishing guides who take care of their clients, and experience the activities recommended. Trip reports sent by returning clients with their own evaluations of the various accommodations, fishing guides, and activities are also carefully evaluated. If you are looking for an unforgettable New Zealand experience call or email Mike or his award-winning staff and enjoy the benefits of their unmatched New Zealand expertise and service or visit his his web site - The Best of New Zealand Fly Fishing.